This illustration depicts an artist’s imagined view of the three planets orbiting an ultracool dwarf star just 40 light-years from Earth. The exoplanets were discovered using the TRAPPIST telescope at European Southern Observatory’s La Silla Observatory. In the illustration, one of the inner planets is seen in transit across the disc of its tiny and dim parent star. 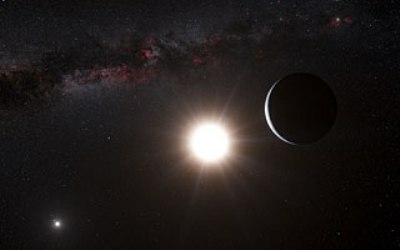 Image courtesy European Southern Observatory, artist’s conception by M. Kornmesser. Astronomers have discovered three exoplanets in a nearby star system that may be comparable to the size of Earth and Venus and one of them may also be located at distance from its star to experience temperatures similar to our planet. The planets are about 40 light years from our planet and orbit a dwarf star that is about one-eighth the size of our sun, or approximately the size of Jupiter. The dwarf star, which astronomers consider to be “ultracool,” is so much cooler than our sun that the system’s habitable zone is much closer to it than in our solar system. A star’s habitable zone is the area of its star system in which temperatures may be hospitable to environmental conditions amenable to life. Two of the exoplanets have orbital periods of less than three days; they probably receive two-to four times the amount of solar radiation that Earth does. The third and most distant of the exoplanets experiences a year that is at least four and as many as 73 days long. “These planets are so close, and their star so small, we can study their atmosphere and composition, and further down the road, which is within our generation, assess if they are actually inhabited,” Julien de Wit, a postdoctoral researcher at Massachusetts Institute of Technology and a co-author of the paper announcing the discovery, said. The two exoplanets closest to their star are likely tidally locked to it, meaning that one side of the planet always faces the star. Those two planets are generally too hot on their day-sides, and too cold on their night sides, to support life, though the team of scientists that published the paper describing them said that there may be small areas on their western hemispheres that might be temperate enough to do so. The third planet from the star could be in its habitable zone, meaning liquid water could occur on its surface. The three exoplanets are the first ever discovered orbiting an ultracool dwarf star. Researchers used the TRAPPIST instrument in Chile to find the exoplanets. Because their star emits so little radiation, compared to larger stars, it cannot be seen with an optical telescope. TRAPPIST, which is an acronym for TRAnsiting Planets and PlanetesImals Small Telescope, detects radiation in the infrared band of the spectrum. Starting in September 2015 the scientists periodically detected a lessening of the amount of the star’s infrared radiation detected by the instrument. That indicated the likelihood that several objects were passing in front of it. The paper describing the discovery of the exoplanets was published online in the May 12 edition of Nature. Scientists have found, for the first time, evidence of water on a rocky celestial body outside of our solar system. The study focused on dust and debris found orbiting a white dwarf star about 170 million light years away. The debris probably came from a planet with a diameter of at least 90 kilometers. The planet may have been much bigger than that, but scientists are limited in their ability to estimate its size by the amount of debris that can now be detected. Oxygen signatures in the debris indicates that the planet would have been, as a proportion of its mass, about 26 percent water. Water accounts for about 0.023 percent of Earth’s mass. 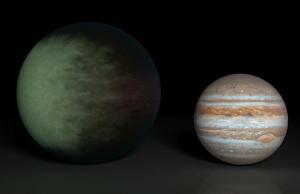 Scientists had earlier found evidence of water outside our solar system in gas giants. This discovery is significant because it is the first indication that water may be found on rocky exoplanets. A possible parallel in our solar system is the dwarf planet Ceres, which has ice buried under its crust. The star around which the debris is accumulated, GD 61, once hosted a planetary system. It became a white dwarf about 200 million years ago. The discovery of the GD 61 system planetary remnants is the twelfth known example of planetary fragments circling a white dwarf elsewhere in our galaxy. Researchers used the Hubble Space Telescope and the large Keck Telescope in Hawaii to make the observations in the study. 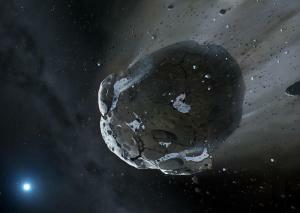 This artist’s conception shows an asteroid fragment around the distant white dwarf GD 61. Artist’s conception (c) Mark A. Garlick, courtesy University of Warwick and University of Cambridge. Note: A version of this story has also been published at Examiner.com.